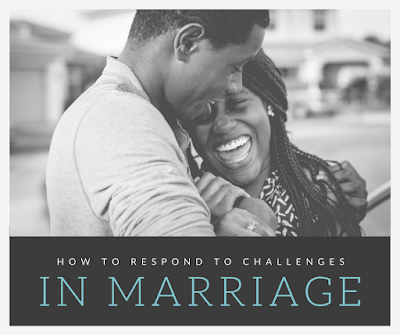 How to Respond to Challenges in Marriage. What to do when difficulties arise. Great marriage advice that is simple but very effective. If normal life didn’t snap you out of your fairy tale view of marriage a few months into marriage, I am sure having your first baby did so. Life’s problems do not magically go away when we get married. In fact, it seems some of the most challenging moments come after we are married. Despite these challenges, being married is overall fabulous. Because it is fabulous, we want to work through these challenges, not run from them. We want to do what we can to resolve challenges so we can maintain a healthy relationship. Some challenges are just a part of life. Health can be a challenge. There can be fertility issues or death of children that bring challenges. There can be death of loved ones. Maybe you have a family member with a disability. Perhaps some natural disaster came your way that brought a list of challenges with it. There are also challenges that are brought on by essentially our own selfishness, lack of empathy, and carnal nature. We can have petty disagreements. We get our feelings hurt. We get annoyed over little things like toothpaste and toilet paper. So how do we respond to these challenges? What do we do to strengthen and preserve our relationship? Here are some tips. View your relationship as one you are in for better or worse. Yes, it can seem easy to walk away. While there are some situations where it is best for one or both parties to end it, in most instances I believe it is best to work through the problems and stay married. If you know you are in this relationship long-term, you will be willing to adapt and work through your challenges rather than tempted to throw in the towel and head off to greener pastures. Isn’t that so true? I often have this talk with Brayden. He will complain that someone or something made him feel a certain way. I emphasize that he gets to choose how he feels in a situation. Leave the situation until you are calm. Explain that you are feeling quite upset and need some time to yourself to calm down. You know how lots of people say to not go to sleep until your disagreement is resolved? Well, sometimes that is bad advice. Sometimes sleep is what we need to wake up with a fresh perspective. Empathize. Try to see things from the other person’s point of view. Why did he do what he did? Was he trying to hurt you? I believe the best in humanity as a whole, and I think in most cases, people are not trying to hurt you. Get help. Talk to church leaders or professional counselors for help sorting out your feelings. Next time, we will talk about dealing with challenges through positive communication. 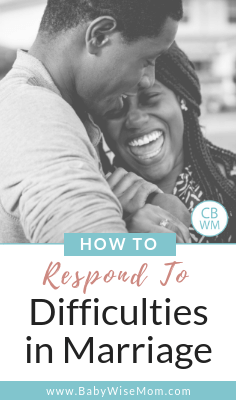 These are great tips for responding with love. And I have also had that conversation with my 5YO when he says someone made him feel a certain way. We can choose our actions and emotions: that's an important concept for anyone to get. I recently wrote a blog on why I love my marriage so much, and in it I list a bunch of reasons why my husband and I work so well. A lot of these reasons are the same as what you just wrote about! Check it out if you have a minute, Val!http://motheroflydiapearl.blogspot.com/2011/10/why-i-love-my-marriage.htmlAs always, thank you for the encouragement! You are all welcome!So true Kristy. And it is so easy to forget in the heat of the moment. Thanks for sharing Motherofpearl!